Mix the salt in water and add this water little by little to the rice flour till it becomes wet /moist. Mix well with hand without any lumps. Fill about half of pressure cooker with water, cover and bring to a boil without putting the weight. 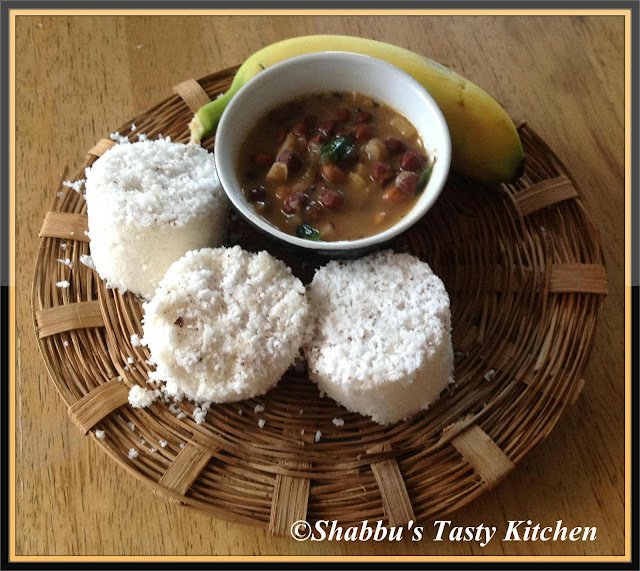 Take the Puttu maker, first add a layer of grated coconut, then add some rice flour and then add the grated coconut. Repeat the process till the Puttu maker is filled. The top layer should be of grated coconut. Place it on top of pressure cooker when steam starts coming out. Steam cook for 5-7 minutes or until steam starts coming out from the small holes on the lid of the Puttu maker. Remove from heat and using a skewer push the puttu out of the puttu maker .Serve hot. Puttu looks too inviting and delicious!!! Wonderful presentation. Reminded me of Kerala. Puttu and kadala,wow wat an authentic dish..
My favourite.. My grandma used to make it for me. If you can, Pls link it to the event in my space. Puttum kadala curryum my favorite too..yummy n delicious!! You can add the chick peas/kadala curry to my Iron Rich foods event..just link it there!! Yummy Puttu and kadala curry..luv the bamboo plate.